For the last two weeks I have been traveling around western Oklahoma, southwestern Kansas, and the northern panhandle region of Texas. I have been participating in the Hi-Plains School of Missions this year. Each day for a week, some 14 churches hold a nightly missions rally and a different missionary will speak to them. As part of this great missions rally and school of missions, I have been traveling to and speaking at a different church every evening and two different churches on Sunday. Today we are nearing the conclusion of two great weeks of fellowship and vision. Two weeks ago, I left Ohio and drove west and south for two days and twenty hours of driving. I arrived in Laverne, Oklahoma, for the orientation that began of Friday afternoon and carried over to Saturday morning. 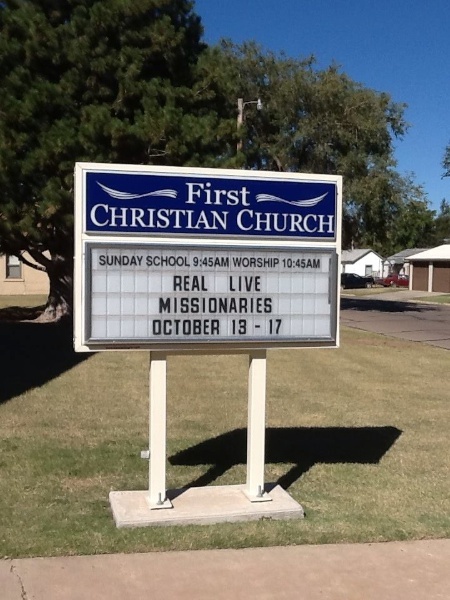 Then on Saturday afternoon I traveled to Alva, Oklahoma for the Sunday morning service the next day. After church, we had a time of fellowship and a great meal and then I was off to Freedom, Oklahoma for the evening church service. I stayed with a family there after presenting the work in Colombia that evening. The next morning I was up and off to the high school for a assembly for the kids. Later I left to head on down to Lone Wolf, Oklahoma for the service on Monday evening. Again, it was a great time of sharing and fellowship and included a bit of touring of the sights in that region. The next morning I again presented our work at the local high school before taking off for the drive back north to Seiling, Oklahoma. That afternoon I staying in the church parsonage and was able to wash some clothes before my evening fellowship dinner and mission presentation. The next morning I was up and spoke at their high school before heading up to Kansas, where I spoke at the church in Protection, Kansas. That was an interesting stay as many of the members were ranchers and we talked about cattle ranching in Colombia and compared it with their way of ranching. From there I headed to Coldwater for the next night a the final service of the first week. Friday was an off day and so I drove up to Medicine Lodge to see the old stockade there and the historic downtown. Then on Saturday I was on the road again as I headed back down into Oklahoma to speak Sunday morning at the Laverne church. In the afternoon I headed Buffalo, Oklahoma for that night. On Monday morning I was on the road heading west and north into Kansas again to speak at Elkhart. As on every other stop we had a great fellowship dinner and a time of sharing about what God is doing in Colombia. From there I headed back down into Oklahoma and spoke that evening at the church in Boise City. Now I am in Delhart, Texas for the penultimate night of the School of Missions. Tomorrow I will drive to Dumas, Texas, where I will finish up. This has been a great experience which I have enjoyed very much. It has been a great time of fellowship with many new dear brothers and sisters here in the high plains region of the tri-state area of the prairie. I have seen many new sites and learned a great deal about a part of our country where I had never before spent much time. I do hope I have been able to inspire them with all that God is doing in Colombia and challenge them to even great service as supporting congregations of the Lord’s work of preaching the Gospel into all of the world. I would hope that I have been used to be a blessing to them just as the Lord has used them to bless me in a very special way.